*TOURNEYTIZER TUESDAY OFFER VALID WITH ANY PURCHASE ON TUESDAY, 3/26/13,4/2/13 AND 4/9/13 ONLY. 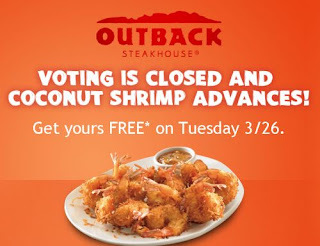 No coupon necessary, say "TourneyTizer" to your server to receive the offer. One per table, per visit. Offer valid for lunch or dinner, dine-in or Curbside Take-Away® (not valid for online ordering).